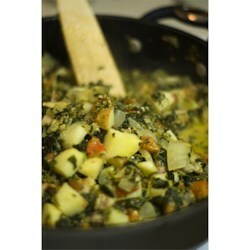 "This is a hearty meal of chicken and potatoes simmered with Indian spices, tomatoes, Swiss Chard, and yogurt. Adjust the spices to taste. Serve it over basmati rice." Excellent. Double the spices and get a truly authentic taste. Wonderful recipe, the entire family loved it. Only change made was just some extra of the listed spices. This was very good. The spices and herbs really made this recipe. It was a meal in itself. I used two packages of frozen spinach--defrosted in the microwave and squeezed out the juices. Janet Canedo - GO STEELERS! will for sure double the spices next time. my potatoes came out fine (all purpose white potato), not mushy. good! This was not bad at all. I'll likely try this again, spicing it up a bit more.